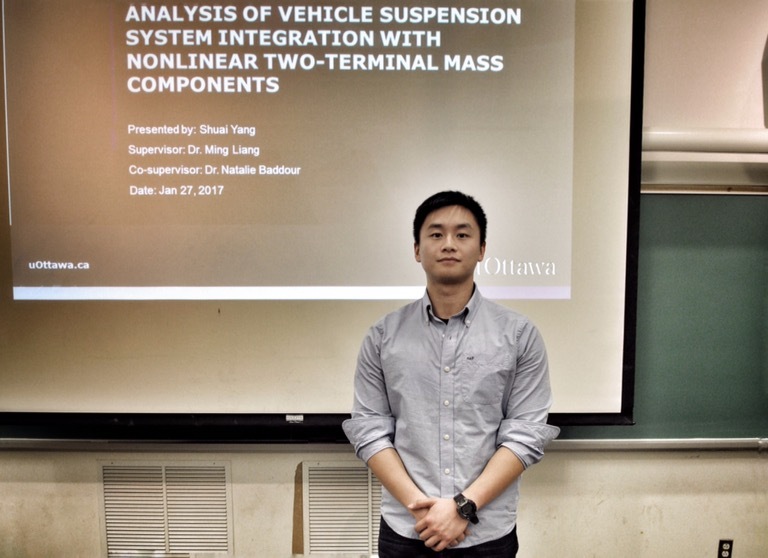 Yesterday, my student Shuai Yang presented his PhD thesis seminar titled “analysis of vehicle suspension system integration with nonlinear two-terminal mass components”. 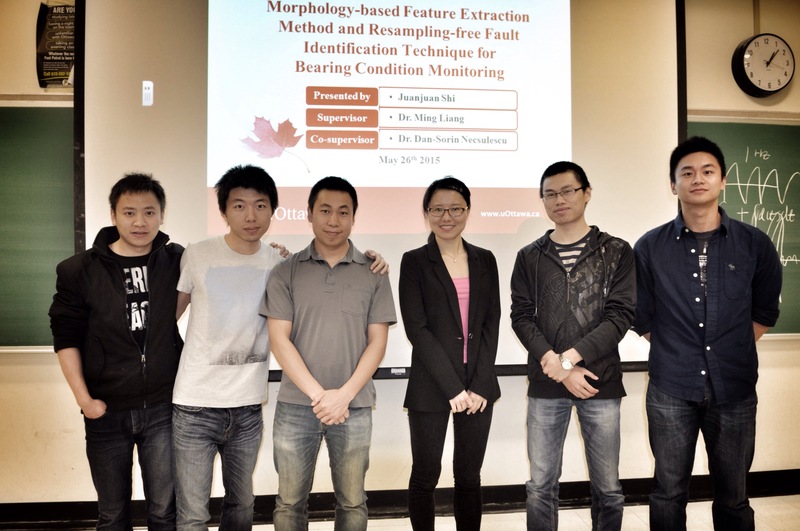 Unfortunately, co-supervisor Dr. Ming Liang could not be present. We were lucky enough to have Shuai’s wife join us. Congratulations Shuai, one step closer to finishing and we are all very proud of you. 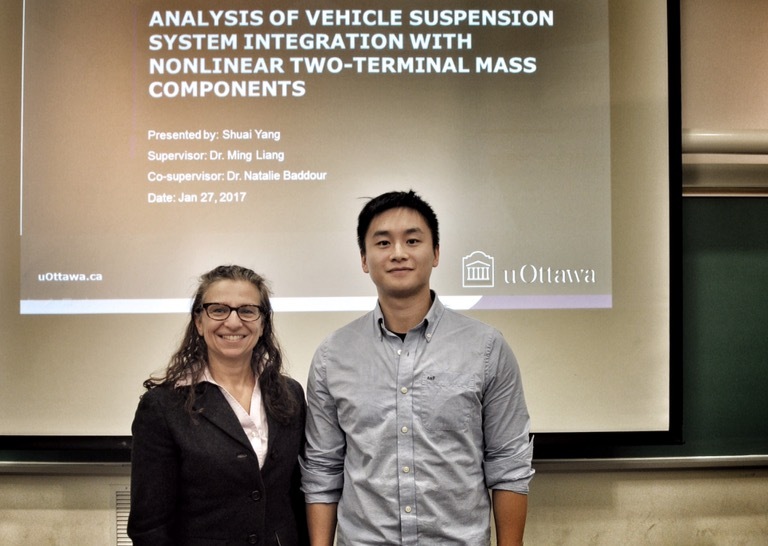 Juanjuan Shi presented her PhD thesis seminar last week. Both supervisors could not be in attendance but luckily a lot of her friends were there in support. Juanjuan Shi to present on the 26th! Juanjuan Shi will be presenting her PhD work on Tuesday May 26th at 10:00am in CB B012. 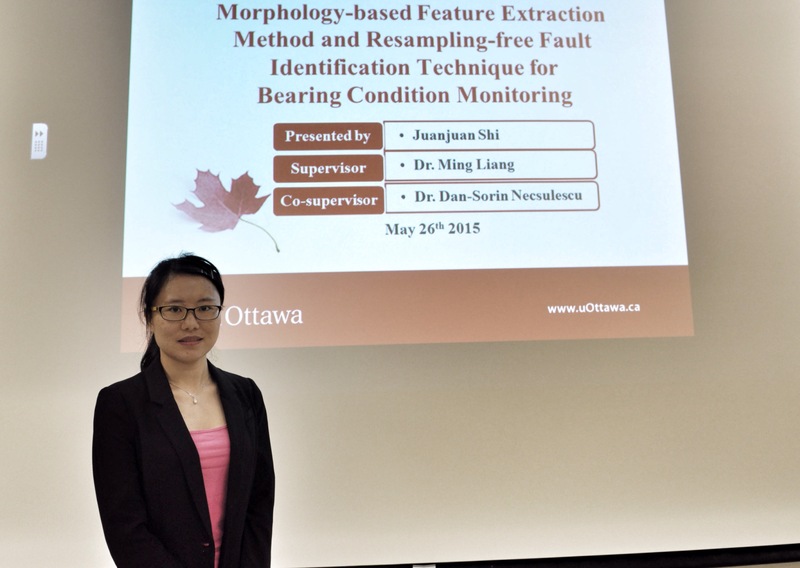 She will give a talk on “Morphology-based feature extraction method and resampling-free fault identification technique for bearing condition monitoring”. 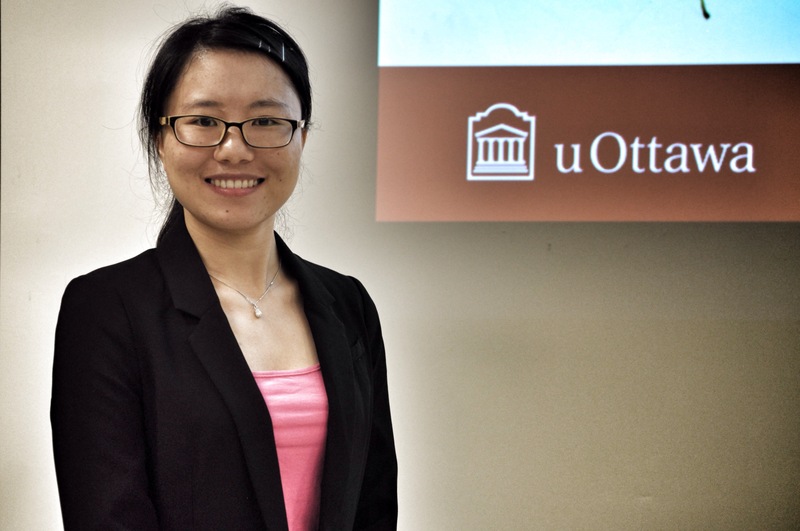 Her supervisors are Dr. Ming Liang and Dr. Dan-Sorin Necsulescu. Abstract of the talk is below. The effectiveness of vibration-based bearing fault diagnosis is often handicapped by 1) background noise and compounded effects of interferences for constant speed case, and 2) non-stationarity plus the two aforementioned factors for time-varying speed case. To address these issues and overcome the shortcomings of filter-parameter-dependence and error-propagation of conventional methods, novel methods are proposed in this work. Two morphology-based methods are first proposed to extract fault features without prefiltering for constant speed case. The first method, based on fractal dimension (FD), can suppress interferences and highlight fault-induced impulse envelope by mapping the signal into FD representation. Its effectiveness, however, deteriorates with the interference frequency increase. Hence, the second method, which isolates impulses from interferences and noise via resonance behaviors, is developed. Both methods are independent of frequency information and can reveal fault features without prefiltering. For bearings under variable speed, since resampling propagates error and complicates the process substantially resampling-free methods are innovatively proposed. A resampling-free order spectrum is derived via the joint application of generalized demodulation and short time Fourier transform, from which not only the existence of faults but also the location of faults can be revealed. Nevertheless, the success of this method relies upon an effective envelope demodulation. Based on the proposed resampling-free order spectrum, a time-frequency analysis technique termed dual demodulation transform is devised and applied to bearing fault identification, without envelope procedure. Yesterday, Wael gave his thesis seminar. So far Wael wins the award for having an audience member who has traveled the furthest to attend a seminar. In attendance was his father in law from Egypt. Click on the photos for larger versions. Wael Moussa with supervisor Dr. Ming Liang. Wael with his father in law – who travelled all the way from Egypt. Next up in our line-up of speakers is Wael Moussa. Wael will be giving a talk on Thermography-Assisted Bearing Condition Monitoring. Bearings are widely used in almost all rotational mechanical systems. The monitoring their conditions are crucial to reliable operations. Although temperature monitoring methods were previously judged as low responsive approaches to mechanical system condition assessment, the advancement of temperature sensing devices and the recent results in rolling contact tribology encourage the revisit of these methods. In this study two systems are implemented respectively using thermography and infrared sensor for detection of the bearing faults based on temperature rise curve during thermal transient period before reaching the thermal equilibrium condition. The results are compared with the finite element model developed using the ANSYS workbench software. It is shown that, although the equilibrium temperature for bearing outer surface is not sensitive to different bearing faults, the temperature rise curve during thermal transient period is sensitive to all bearing faults. Furthermore, this transient curve is useful in finding lubricant performance and specifying optimum lubricant volume for every operating condition. To further exploit the rich information provided by the data during the thermal transient period, a system that stimulates such a transient behavior is proposed. This is done by changing the temperature of the bearing surrounding environment using surface heaters . The results have shown a great similarity between the stimulated transient behavior and the actual one observed at the beginning of the bearing operations. It is also shown that bearing faults can be detected even after the bearing enters its thermal equilibrium condition. This study has demonstrated that the temperature-based approach can effectively detect lubrication deficiency long before a physical bearing fault develops. As the lubricant deficiency eventually causes physical bearing damages, this makes the temperature-based approaches particularly effective in early fault detection, thought such approaches tend to be less responsive to actual physical damages themselves. 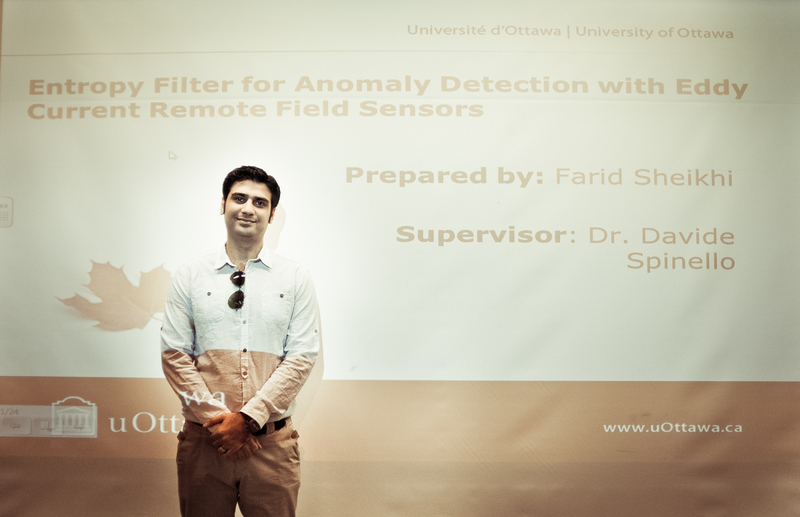 Farid Sheikhi presented his MASc thesis seminar last week. Supervisor Davide Spinello was teaching at the time so was unable to attend. Click on the photo for a larger version. Farid after presenting his thesis seminar. Missing from the photo is supervisor Dr. Davide Spinello. Elhamosadat Alavi Foumani presented the results of her thesis this past Friday. She talked about detection of cracks in bladed disks via advanced signal analysis. Interested parties can review the slides of her presentation. 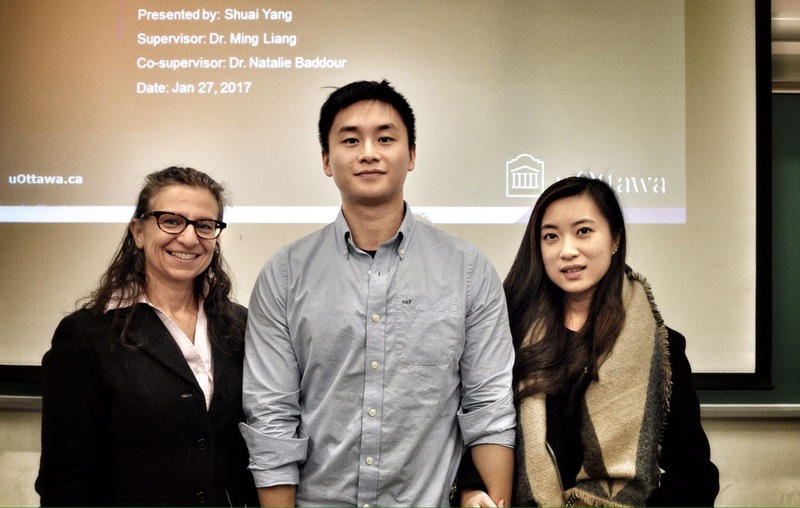 Photo of Elham with supervisor Dr. Ming Liang is below – click on the photo for a larger version. 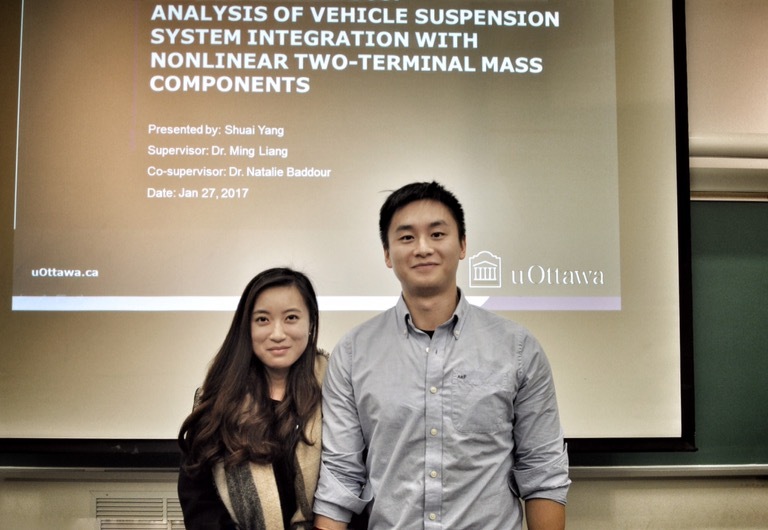 Dr. Ming Liang with student Elham Alavi after her thesis seminar, February 2013.